"Bruce must go" campaign even more than it is now. Hell, just a press conference from Dan and Bruce would go a long way to finding out whats in their head. we'd have to only hope one of the press corp would ask Dan how in the world Bruce is still here after all these years and "why" we don't have a legit GM. The Dan and Bruce team think they know more than 31 other teams, but I hate to break it to them, being the laughing stock of the league shouldn't be something they're proud of. I know it's fun to hate Dan Snyder, but am I the only one who can't see the relevance of the yacht story and him being a ****ty owner? Billionaires spend lots of money on stuff. A good owner could do the exact same thing. The two don’t really correlate but it’s just another log on the blazing fire that is hatred for Snyder. His team stinks, his fanbase is dying off and he doesn’t have the balls to speak to them nor the balls to force Bruce to do it. Instead he’s taking luxurious vacations and trying to increase the size of his anatomy by purchasing yet another yacht. the comments about the Yacht are amusing on twitter or at least amusing to me. A quick google search and you'll find tons of owners have yachts like this. They are billionaires. The fire is blazing bc stories like this come out and the fans and media and stupid platforms like twitter fuel it. "But Danny talk to us!" I wouldn't talk either if everyone hated my guts for everything I ever did, even in my own personal life with my own personal money. Why should he care how well the team does? Dan is obviously winning off the field. The more and more you post I’m convinced that you’ve been planted by Dan or Bruce, perhaps related or something of that nature. I’m not even saying that as a joke or to be snarky. It’s the only logical reason to defend them and hate the meanie media like they do. Sure you are, but that's OK. Pretty used to it. Was just echoing @TD_washingtonredskinsthoughts. 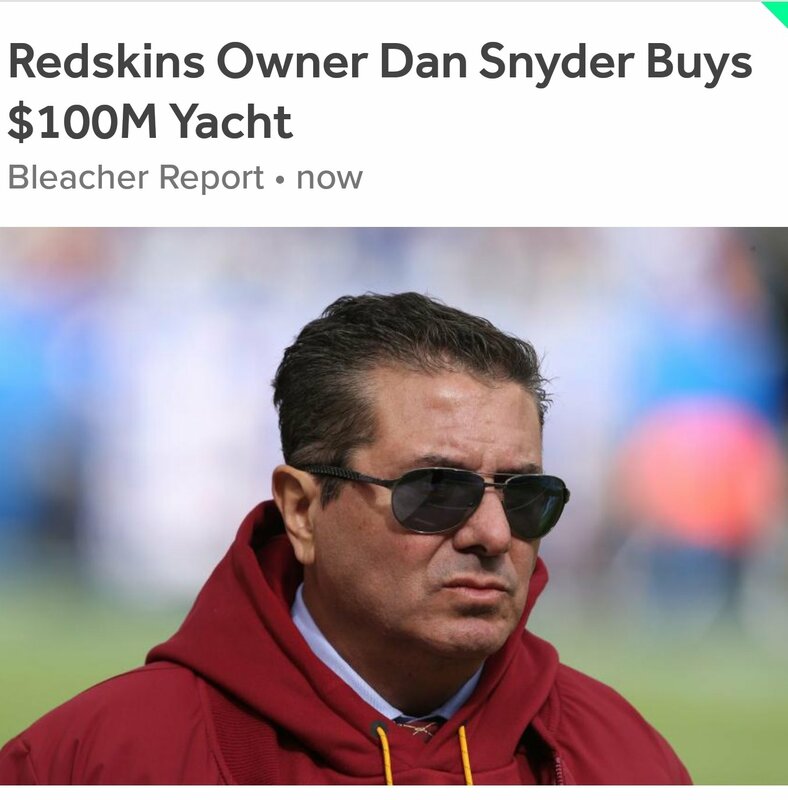 There's a lot of things to loathe Daniel Snyder for, but buying a nice yacht does not seem like one of them. I don't know Dan or Bruce personally and certainly could care less about "defending them." What I loathe is the pile on efforts by our own fans, but growing more and more aware that's the norm and I'm one of the outsiders. It's the "instead" in your sentence that I take issue with. Hate all the things you mentioned about him being a coward and not having the first clue how to fix the team...I'm with you. But why his purchase of a yacht even enters into the conversation, I won't understand. Dan is becoming more isolated, I see. That is the iMAX problem. Next we will hear he is becoming a prepper. Hunker down in yer own bunker, skins fans. As the 2015 NFL season kicks off and all the excitement that comes along with it, let us not forget that U.S. taxpayers are bearing a large part of the cost. In the past 15 years alone, over $12 billion of the public’s money has gone to privately owned stadiums—constituting essentially a massive transfer of wealth from everyday Americans to the super-rich owners and players involved in these billion-dollar sports franchises. The Dallas Cowboys ushered in the era of the billion-dollar stadium when their current facility opened in 2009. Taxpayers assumed the cost for over a quarter ($325 million) of its $1.2 billion dollar price tag. At the under-construction U.S. Bank Stadium, where the Minnesota Vikings will eventually play, public dollars account for roughly half the cost—an estimated $498 million—of the total $1.06 billion bill. Although Minneapolis initially required a public referendum to approve funding for the stadium, a “stadium authority” was able to override the referendum and authorize the budget without taxpayers’ consent. ...wide array of studies have shown that professional teams add virtually no income to local economies. In fact, some of them find that large subsidies actually have a negative effect, taking money out of the local economy. Aside from the jobs generated by actually building the stadium, most jobs inside the stadium—selling food and beer or working at team concessions—are low-paying temp jobs. It’s even worse for football stadiums, which are used for games at most a dozen times a year, and maybe a few more times for concerts or large events. Public economic development dollars can be put to much better use on things besides subsidizing sports teams and their wealthy owners. It’s time put an end to runaway public subsidies to lucrative sports franchises. Is there any other industry or field of business where taxpayers are asked to hand over astronomical sums to billionaire owners and their millionaire employees? Dan Snyder spends 100s of millions of dollars on just yachts, not even counting his airplanes, houses, land purchases, cars, etc. Yet he expects some relatively poor city to pay for his stadium. Buy it yourself and keep up the losing and nobody would care. Just watched this, interesting in retrospect this is back from 2011. Part of the narrative is part of the fans dislike of Dan is driven by how little he talks -- clearly that hasn't changed at all over the years and if anything its gotten worse. I've seen him say this on and off and he does it here too about how he knew nothing when he was 34 so he in effect deserves a pass for his younger years mistakes. He seems genuine in talking about being driven by winning a SB trophy and its going to have his father's name on it. The best I can say for all of that is it makes Dan an easy mark for Bruce's rap (Jay too) about how close this current team is to the promised land. But its hard for me to believe the dude is that naive. The puns that will be coming out now. Snyder's chances of the Redskins winning has just sailed off into the sunset. A fool and his money is soon departed. Soon we will read about how Snyder ran his yacht aground. When asked how it happened, he will tell reporters he thought " W " on the compass stood for winning. I bet the fool will paint the life rings sea green so it is color-coordinated with the ocean. I hope he gets a chance real soon to test them out ! When Snyder goes on a cruise on his yacht, he will have to bring along a plastic milk crate to stand on so he can reach the controls. I hope the first movie he watches on his toy is Titanic. A reporter asked Snyder if he will have a dinghy in case of emergencies. He said " no, Bruce isn't coming on this trip". Sorry, its the only way I can halfway laugh without crying. Spend all of that money on a damn boat but gives the strength & conditioning room 4 cinderblocks to use as weights. Not sure what is the big deal of Dan buying a yacht. Redskins also donated millions to various causes and even donated his plane to transport supplies to Bahamas. But yet he can't buy himself a toy without being ridiculed about it? I personally don't care what he does in his private life as long as it doesn't DIRECTLY effect the product on the field. I would really like to know if he didn't buy a yacht would we have won a SB instead? I am a business owner and maybe I see things differently. Well, personally, I would have liked to see him invest in better training facilities. Not like they couldn't use it. Didn't the Redskins upgrade their healing stuff though recently? I am pretty sure he has money budgeted for Redskins facilities. I really don't know what they need in that area though. Cinder blocks are always an easy grab from Home Depot though. I suspect you are a much better business owner than Dan Snyder while making a pittance in comparison. I don’t suspect you are begging tax payers for money to fund upgrades to your business either. No owner who had their stadium paid for should be able to afford 100 million dollar boats unless the city or state gets partial ownership and use of it for events open to public. And the new one isn't even the first. His other yacht was slightly less expensive. Maybe there are others. I'd like to see what kind of property he owns in places like the Bahamas, for instance. I mean the dude can obviously afford to pay for his own stadium himself. After running the team like the Soviet Union for 2 decades, and deciding that he's doing everything my way despite repeated failure, he should expect to be doing nothing other than that. Do it your way and in the process pay for it your way as well. The question is, is snyder going to be watching the game on Sundays from his owner's box, or on his imax fueled yacht? Maybe he is abandoning Fed Ex field with everyone else. Hi Dan. Did I ever mention I’ve never been to the Bahamas?